This article was originally published in the March 15, 2017, edition of the Sun. 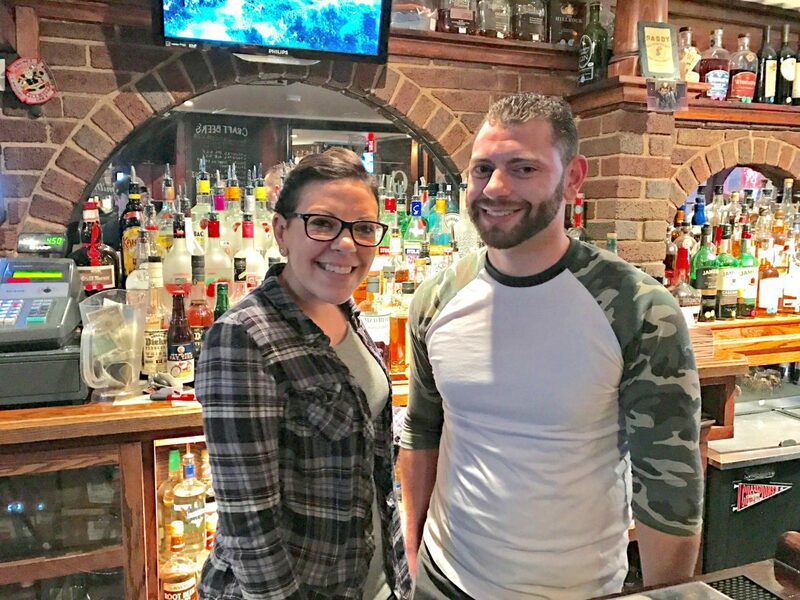 The Cosmo is always looking for its next generation of regulars, which makes it a perfect fit for our Survivor Series showcasing Worcester small businesses standing the test of time. 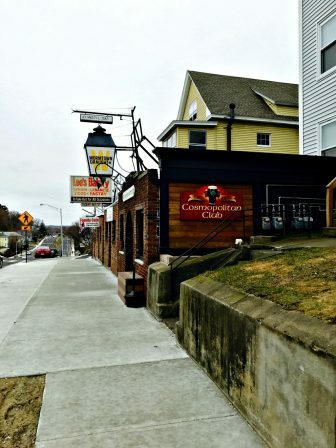 At the crest of Hamilton Street’s rolling, mile-and-a-half span in the heart of Grafton Hill sits The Cosmopolitan Club, a neighborhood bar burrowed at the base of one of the area’s many three-decker homes. From its beginning as a single two-lane dirt road, Hamilton Street and the surrounding area has undergone a number of transformations to accommodate travelers and neighbors alike as far back as the mid-1920s and as recently as last summer. 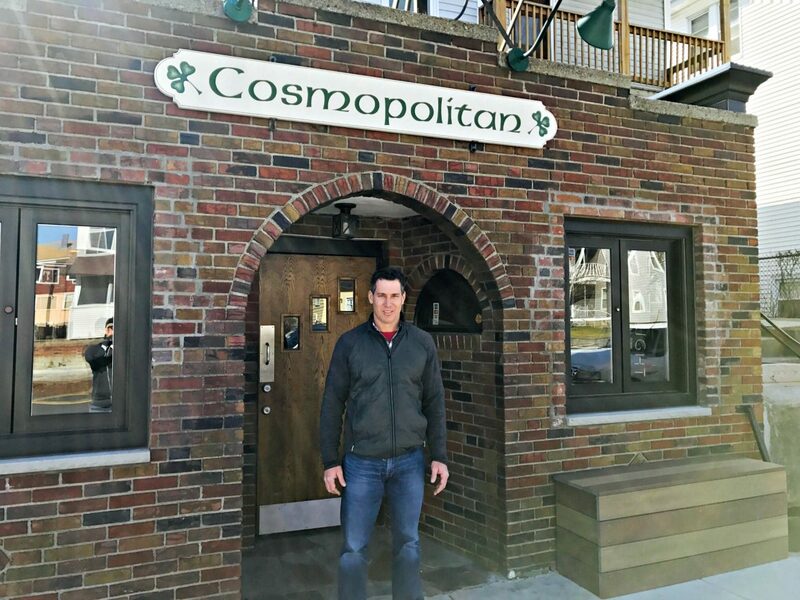 The one constant for the better part of a century has been “The Cosmo,” as it’s affectionately known by its regulars, which opened in 1935 as the post-Prohibition era poured into full swing. In its 82 years of existence, the club has witnessed the wide lanes of Hamilton street in the heyday of the city’s trolley cars, and the subsequent addition of “passing lanes” in the 1940s to replace the trolley tracks as automobiles became more affordable and kicked trolley service to the curb. The Cosmo looked pretty much the same back in the black-and-white days (photo taken June 24, 1949). “Up until recently, Hamilton Street was, like, a four-lane highway with cars speeding up and down. Now they’ve slowed it down and reconfigured it making it more neighborhood friendly,” Cosmopolitan Club owner Matthew O’Mara said, referring to last summer’s addition of bike paths narrowing of Hamilton Street to one lane on each side. The Cosmo, it seems, is a place where many things begin trending upward. “People have [drunk] their first beer here, met their wives here, things like that,” said Tim McCann, a former longtime bartender there who has served on the city’s Historical Commission. Indeed, Mark Lavin, who worked three shifts a week behind the bar during his first six years there, now only works Tuesday nights. He’s spent most of his evenings the past six years at home with his two sons, Brendan and Patrick, and his wife, Jen, who he met — where else? — at the Cosmo. “I had a pair of regulars that always told me they had a niece my age that was single. They talked her up for months and months until they finally brought Jen in on a Saturday afternoon [in April 2008] during my shift. And that was that. We’ve been together ever since,” Lavin said. The Lavins were married three years later in May 2011. Mark Lavin is chief among the many longtime bartenders and staff at the Cosmopolitan Club. For the first 65 years of its existence, the Cosmo was owned and operated by the Murphy family. 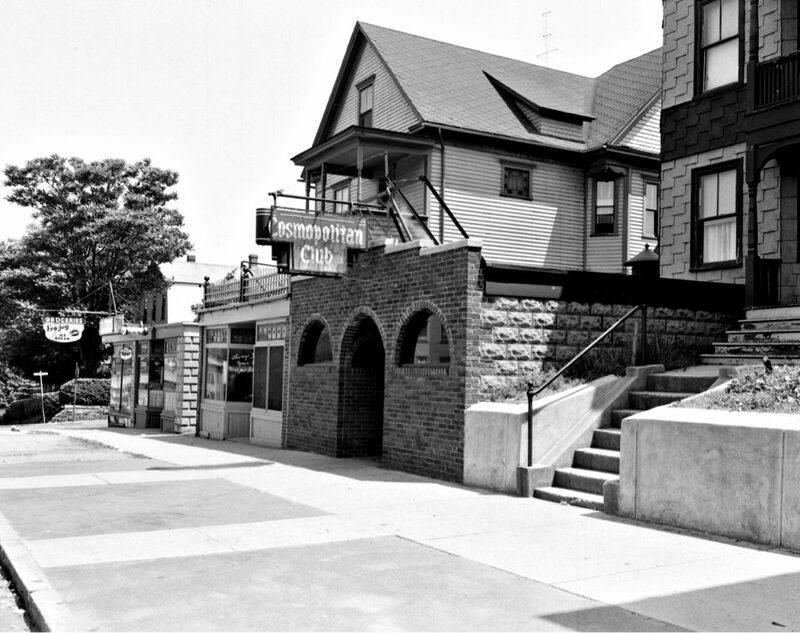 Edward W. Murphy Sr. and Theresa F. (Bilske) Murphy purchased the bar in 1935 and Edward operated it until his death in 1948. Theresa owned, managed and operated the bar the next 27 years, until her retirement in 1975, passing the reins to her son, Edward Jr. In May 2000, over a draft beer at The Cosmo, O’Mara — with the help of his parents, Michael and Beverly — agreed to purchase the bar and the three-decker behind it. “I heard through the grapevine that Ed Murphy was thinking about selling and retiring and moving to Florida. I stopped in one night, had a beer with him, and pretty much shook his hand on it. O’Mara’s father tended bar at the Cosmo in the early 1980s. “It helped that Eddy knew my father and my family. There were a bunch of people interested in the place. And he gave us first crack at it. We hashed out a deal at his kitchen table in less than ten minutes,” O’Mara said. In a matter of 24 hours, over two brief conversations, the ownership of the Cosmopolitan Club changed hands between two families for the first and only time in 82 years. O’Mara, 42, graduated from St. John’s High School in 1993, Assumption College in 1997 and earned a master’s degree from Clark University in 2001. He worked as a code enforcer for the city before joining the Worcester Fire Department in 2008. O’Mara was promoted to captain in 2015. He lives in Grafton with his wife, Gina, and two children, Ellie, 4, and John, 2. Since O’Mara took over the club, he said he has made changes with the intention of staying true to the original design and the history of the place. “When I bought it, it was in rough shape and for the first two and a half years, every dime I made here went right back into the bar,” O’Mara said. 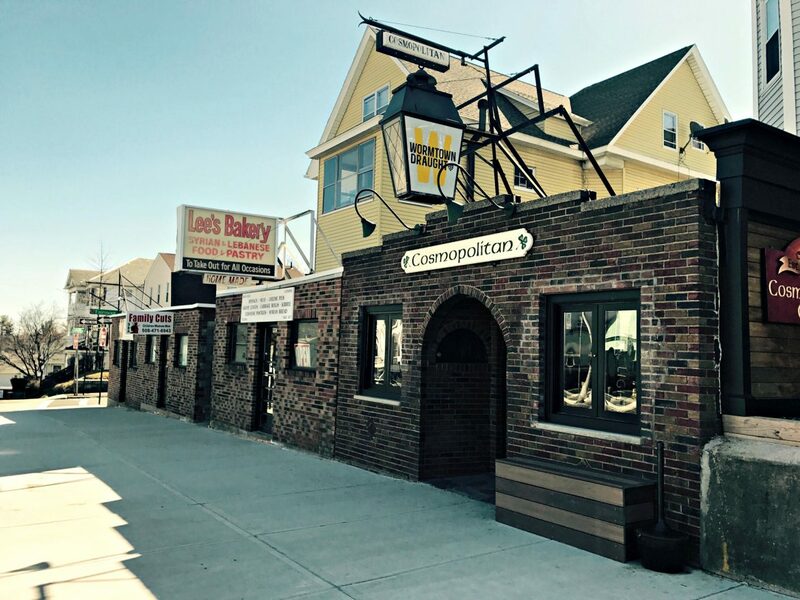 O’Mara said he has replaced the “guts” of the building, including the electrical work and plumbing; the coolers and beer draft system; replaced the windows; installed new bathrooms with granite countertops; new hardwood floors; and cleanup of the original exposed brick that lines the walls throughout the bar. Most importantly, O’Mara kept the bar itself in its original location — nearly flush to the entrance, it is the first thing visitors see when they open the door to the historic building. O’Mara said he’s considering more facade work, putting the seating area in the back of the bar to better use, and adding four lines to the club’s eight-line draft beer system. “As a business owner, you don’t mind investing in your business especially when you see the city investing in their infrastructure,” O’Mara said. Another thing business owners don’t mind? Reliable employees. O’Mara credits the consistent presence of long-time bartenders for the bar’s extended longevity and continued success. Courtney and Andrew Duclos, siblings and fellow Cosmo bartenders. Much like the Cosmopolitan itself, the staff has bucked the typical turnover and employee churn in the bar and restaurant industry. McCann, 36 and now on the board of Preservation Worcester, tended bar at the Cosmopolitan from 2003 to 2013 and knows a thing or two about its long history. McCann said the stories told at the bar from patron-to-patron or patron-to-bartender are what carries the history of the Cosmopolitan from one generation to the next. “Anytime there was a big fight on TV, you would hear people say ‘Oh, I watched Ali-Frazier here. Or I remember when so-and-so came back from Vietnam and this is the first place he stopped to have a beer,” he added. According to O’Mara, former owner Ed Murphy would boast that the Cosmopolitan was the first bar with a television in the city. “That was his claim to fame in this place,” O’Mara said. 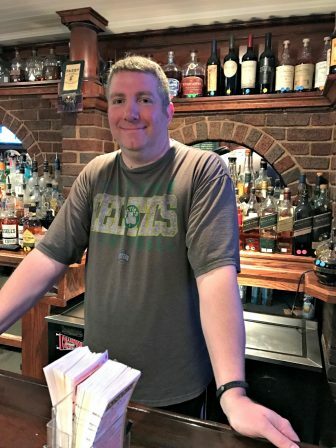 Garrett Crawford, 43, of Grafton, is another former Cosmo bartender who began dating his wife, Erin, at the Hamilton Street haunt over a game of billiards. Crawford tended bar there from 2008 to 2013 and was a twice-a-week regular before that. It was 2002 when he initially got the ball rolling with Erin. The pair has been married for 10 years. “I had just gotten out of a relationship when I got a call from my future wife and she said, ‘What’re you doing? Come up to the Cos’. She was up here with one of her friends and, at the time, there was a pool table in the back. “I played a couple games of pool with her, and the rest is history,” Crawford said. 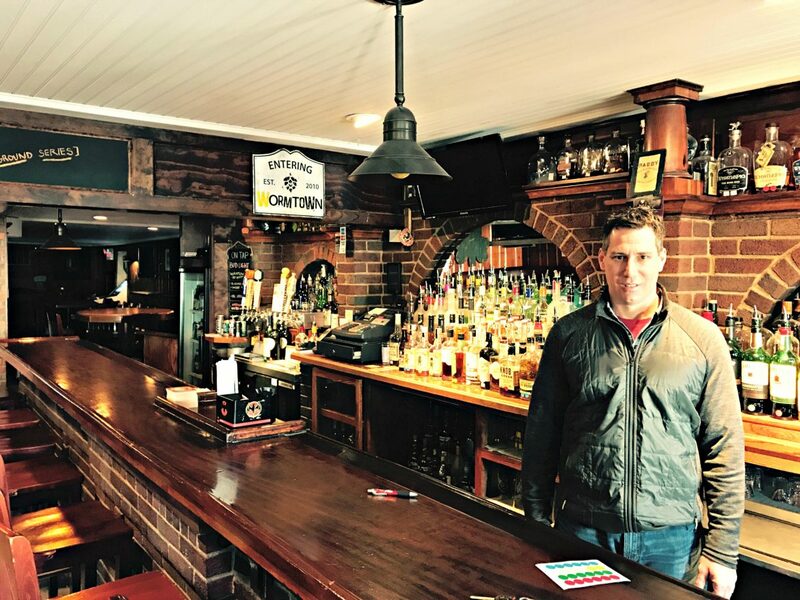 O’Mara said he’s seen the highs and lows of the neighborhood, but over the past five years he has seen gradual improvement on Grafton Hill resulting in an increase of new faces at the bar. Matt O’Mara bought the Cosmopolitan Club over a beer — where else? — at the Cosmo. Lavin, ever the bartender, throws a nod to the establishment’s improving list of brews which comprises some 60 craft beers. Even with a robust crowd of regulars and a gaggle of longtime employees, O’Mara knows it’ll always be the newcomers who keep a bar going. “It’s important to have places like the Cosmo still up and running because it serves as a meeting place for neighborhood people to come together,” McCann said. “Frankly, it’s something that doesn’t get built anymore. The Cosmopolitan Club is open noon to 1 a.m., Sunday through Thursday; noon to 2 a.m. Friday and Saturday.